The search for the next big thing in sports hasn’t changed since 776BC, today the goal is to replicate the success of Cricket’s T20 formula, 2-3 hours of high level competition that can be packaged as entertainment as much as a sporting contest. Following Cricket’s lead has been Squash, Tennis, and Golf who have all launched short forms of the game. Supercars has worked over the past 10 years to find the perfect format, Townville for example, started life as a 2 x 200km races, but was extended to replicate Clipsal and turned into 2 x 250km races, before returning to 2 x 200km races the following year. 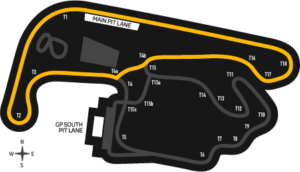 Clipsal, the gold standard of motorsport events has seen Supercars play with the format with changes that have included: single qualifying for both of the Saturday Races then to individual qualifying sessions (one for each race), and then there is the race lengths from 2 x 250km to 2 x 125km + 1 x 250km races eventually settling back at 2 x 250km runs. Who could forget the success of the 60-60 Saturday races that featured the much loved AZ (Acceleration Zone) Boards. That format was dumped soon after it started, only to return as 2 x 60 km races two years later. Most of the members of the paddock who have been around for a few years, believe that longer races for Supercars produce the best result, for the fans, drivers, crews and most importantly in this day and age the viewers, but time and time again a change to the format of an event has resulted in a return to the previous format shortly after. Now this is not to say that you should never change anything. I am a change junkie, anyone who says “we always have done it that way” is waving a red flag to a bull. But if the answer to why you do it this way is a considered and reasoned response, then you will find little to no argument from most reasonable people. And why wouldn’t you want to see a change that will fill the seats of Sydney Motor Sport Park and Phillip Island? So it has been pleasing to hear that Supercars are not planning to change the formats again, but Supercars are looking for that mystical T20 format. The reported idea is a Sydney Night event and while that sounds attractive, how can you fit 3 days into 2-3 hours? NASCAR and AUSCAR had some very successful nights at Oran Park and the then Eastern Creek under lights with practice, qualifying and races all on the one night, which could be replicated by Supercars, with some success. But, if you want a night of excitement that is not Championship Lite, I would say look no further than the Speedway GP or better still Speedway Best Pairs. What is that you ask? It is team racing over a short distance (4 laps of a 400m track) 2 riders from one team against 2 riders from another. The teams battle it out over 20 heats, with the top point scores moving on to the semi-finals, then the winners move on to the Final with a run off for 3rd place. How could you do that in Supercars? As this is a special one off event, you could say that only the top 10 team in the championship would be invited to the show. Single Car teams would have to pair up with another team (not a stretch as they share a pit boom with one already). Supercars didn’t want to do it straight off the standings, take the top 8 teams in points then have 2 other teams selected by Supercars or one by the promotor and the other by a fan pole on their website. Rather than each car having a set of tyres for the night, issue 3 sets of tyres to be shared between the team and for a bit of extra spice, have one set of Wildcard (Ultra Soft) Tyres that the team can use at any time they choose on either of the cars.